The Shimpo DT-725 battery-powered digital stroboscope has a xenon flash tube, internal and external trigger modes and a continuous duty cycle. It is designed for motion analysis, preventive maintenance, printing inspection, harmonics analysis, and speed measurement of repetitive motion. The xenon flash tube has a 10 to 15 microsecond flash duration to provide crisp images in brightly lit areas. Xenon flash tubes have brighter light output and a shorter flash duration than LED lights. Bright light output is required for quality images in brightly lit areas, and shorter flash durations provide sharper images, especially at high rates of speed. The stroboscope has a 40.0 to 12,500 flashes per minute (FPM) range and an accuracy of + or - 0.02% of reading. Built-in multiply-by-2 and divide-by-2 functionality allows the operator to distinguish true RPM from harmonics. Internal mode phase shift has a 360 degree range in six seconds. Phase shift enables the operator to adjust the focal point of the object to any point in the rotation without moving the trigger point. Synchronous output enables the stroboscope to drive other strobes for wider coverage. The 5-digit, 8mm tall LED display eases reading in low lighting. An integrated 1/4" - 20 Unified Coarse (UNC) mounting thread and continuous duty cycle provide permanent installation and long-term use without the need for cool-down periods. The high-impact plastic housing provides durability. The stroboscope includes a 115V AC adapter and instructions. Stroboscopes are used in a variety of settings including manufacturing, printing, education, and photography. Switch or relay contact Power requirements Internal rechargeable battery with 115V AC adapter, 50/60Hz Battery life 1 to 2 hours, depending on flash rate Housing High-impact plastic Dimensions 8.5 x 4.3 x 9" (H x W x D) Weight 2.75lbs./1.25kg H is height, the vertical distance from the lowest to highest point; W is width, the horizontal distance from left to right; D is depth, the horizontal distance from front to back. Stroboscopes evaluate the functionality of fast-moving rotational objects, such as belts, fan blades, and other machine parts. They are used in industries such as manufacturing, entertainment, high-speed printing, wood and metal turning, and in education and research settings. Stroboscopes have a flashing light (strobe) that, when directed at a moving object, makes the object appear to be stopped or moving in slow motion. This enables the operator to evaluate machine performance without stopping the machine. Stroboscopes use either xenon flash tubes or LED light sources. The strobe is triggered either internally, which allows the operator to manually adjust the flash rate, or externally and automatically by a peripheral sensor. Multiply-by-2 (2/4 or 2X) and divide-by-2 (1/2) functionality enables the operator to verify the actual revolutions per minute (RPM) and to distinguish true RPM from harmonics. Phase shift adjusts the flash delay in degrees of a full rotation, and time delay adjusts the flash delay in seconds or fractions of a second. Input and output features enable the operator to use peripheral sensors to trigger flash rates, to perform tachometer operations, or to daisy-chain stroboscopes. 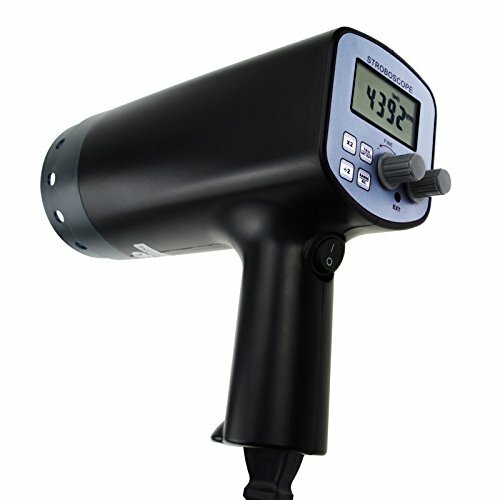 The Monarch 6206-012 Nova-Strobe battery-powered digital stroboscope has a xenon flash tube, a 30 to 10,000 flashes per minute (FPM) range, internal phase shifting, and continuous duty cycle. It is designed for motion analysis, preventive maintenance, printing inspection, harmonics analysis, and speed measurement of repetitive motion. The xenon flash tube has an auto-adjustable 8 to 20 microsecond flash duration to provide crisp images in brightly lit areas. Xenon flash tubes have brighter light output and a shorter flash duration than LED lights. Bright light output is required for quality images in brightly lit areas, and shorter flash durations provide sharper images, especially at high rates of speed. The stroboscope has a flash rate range of 30 to 10,000 FPM and a flash rate accuracy of 0.002% of setting or + or - least significant digit/0.01 for use in slow-to-medium speed applications. Built-in multiply-by-2 and divide-by-2 functionality allows the operator to distinguish true RPM from harmonics. Internal phase shift functionality allows the operator to manually rotate the target location clockwise or counterclockwise in 5 degree increments. The built-in 1/4" - 20 UNF (Unified Fine) thread mount and continuous duty cycle provides continuous use over the life of the battery without the need for cool-down periods. The stroboscope includes a 115/230V AC universal battery charger with interchangeable wall plugs and instructions. Stroboscopes are used in a variety of settings including manufacturing, printing, education, and photography. Handle: 4.35"/108mm Weight 1.5lb H is height, the vertical distance from the lowest to highest point; W is width, the horizontal distance from left to right; D is depth, the horizontal distance from front to back. Monarch Instrument manufactures devices such as tachometers, stroboscopes, data loggers, and leak detectors. The company, founded in 1977 and headquartered in Amherst, NH, meets International Organization for Standardization (ISO) standard 9001:2008. The Shimpo DT-725KIT battery-powered digital stroboscope has a xenon flash tube, internal and external trigger modes and a continuous duty cycle. It is designed for motion analysis, preventive maintenance, printing inspection, harmonics analysis, and speed measurement of repetitive motion. The xenon flash tube has a 10 to 15 microsecond flash duration to provide crisp images in brightly lit areas. Xenon flash tubes have brighter light output and a shorter flash duration than LED lights. Bright light output is required for quality images in brightly lit areas, and shorter flash durations provide sharper images, especially at high rates of speed. The stroboscope has a 40.0 to 12,500 flashes per minute (FPM) range and an accuracy of + or - 0.02% of reading. Built-in multiply-by-2 and divide-by-2 functionality allows the operator to distinguish true RPM from harmonics. Internal mode phase shift has a 360 degree range in six seconds. Phase shift enables the operator to adjust the focal point of the object to any point in the rotation without moving the trigger point. Synchronous output enables the stroboscope to drive other strobes for wider coverage. The 5-digit, 8mm tall LED display eases reading in low lighting. An integrated 1/4" - 20 Unified Coarse (UNC) mounting thread and continuous duty cycle provide permanent installation and long-term use without the need for cool-down periods. The high-impact plastic housing provides durability. The stroboscope includes a 115V AC battery adapter, a spare flash tube, carrying case, and instructions. Stroboscopes are used in a variety of settings including manufacturing, printing, education, and photography. Spare battery pack with built in charging electronics. Used for DT-900 model stroboscope. Pack of 1. Rechargeable NiMH Battery Pack for BBX, DBX, PBX model strobes. 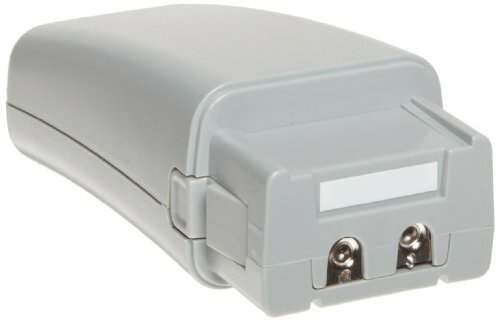 Rechargeable NiMH Battery Pack for BBX, DBX, PBX and VBX models. 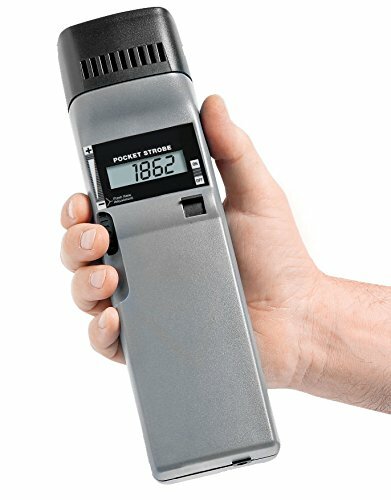 The Monarch 6235-010 PLS pocket LED stroboscope has internal and external modes, time delay, phase shift, and a NIST Certificate of Calibration, and provides inspection and speed measurement. It is designed for motion analysis, preventive maintenance, printing inspection, and speed measurement of repetitive motion. The 7-array LED light source has a light output of 1800 lumens at 6000 flashes per minute (FPM) eight inches from the lens. Adjustable flash duration of 0.1 to 18 degrees or 0.5 to 2500 microseconds. LED lights have a longer bulb life and require less energy than xenon flash tubes and can extend the battery life of battery-powered stroboscopes, have a lower heat output, and quieter operation when used in audio testing. The internal flash mode has a range of 30 to 300,000 FPM and 0.5 to 5,000 hertz (Hz) and has an accuracy of 0.005% of setting, or + or - last digit. The external flash mode has a range of 0 to 300,000 FPM, 0 to 5000 Hz and accuracy of + or - 0.005% of reading, or + or - last digit. A NIST Certificate of Calibration ensures accuracy. Built-in multiply-by-2 and divide-by-2 functionality allows the operator to distinguish true RPM from harmonics. Separate 3.5mm (1/8") transistor-transistor logic (TTL) input and output jacks provide power to remote sensors and allow multiple strobes to be daisy-chained to provide wider coverage. 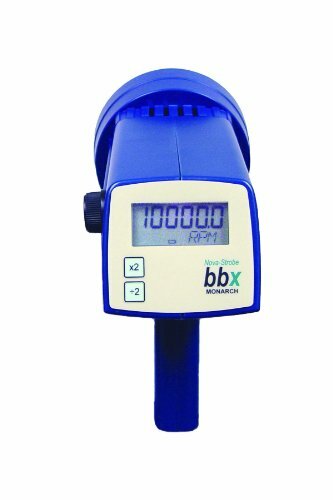 Tachometer mode, available for use while the stroboscope is in external mode, has a measuring range of 30 to 300,000 rpm (requires remote sensor, not included). Phase shift of 0.1 to 18 degrees of rotation and time delay of 0.5 to 2500 microseconds allow operator to manually adjust the focal point of the object to any point in the rotation without moving the trigger point. A continuous duty and integrated 1/4" - 20 UNF (Unified Fine) thread mount enables the stroboscope to be used continuously over the life of the battery. Five user-selectable flash rates can be programmed into the device and recalled after powering off. The stroboscope is powered by 3.6V DC internal rechargeable lithium-ion batteries with an average run time of 5 to 6 hours between charges. The stroboscope includes universal 115/230V AC battery charger with interchangeable wall plugs, a NIST Certificate of Calibration, and instructions. It is RoHS compliant and CE marked. Stroboscopes are used in a variety of settings including manufacturing, printing, education, and photography. 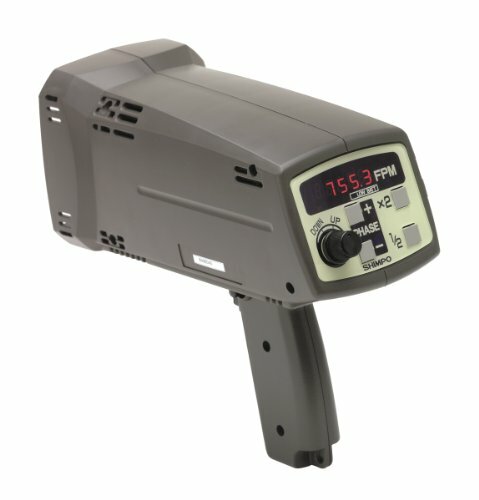 Specifications Internal mode flash rate range and accuracy 30-300,000 FPM, 0.5 to 5000 Hz and accuracy of 0.005% of setting or + or - last digit External mode flash rate range and accuracy 0 to 300,000 FPM, 0 to 5000 Hz and accuracy of + or - 0.005% of reading or + or - last digit Resolution Resolution of 0.01 to 1 FPM (selectable), 0.1 FPM resolution above 9,999.99 FPM, 1 FPM resolution above 99,999.9 FPM Tachometer range (External mode only) 30 to 300,000 RPM Time and phase delay Adjustable 0.5 to 2500 microseconds, or 0.1 to 18 degrees of rotation Light source and output 7-array LED light with 1800 lumens at 6000 FPM 8 inches from lens External input 2.5V to 12V peak pulse 500 nanosecond minimum pulse width, positive- or negative-edge triggered, selectable Output pulse 3.5mm (1/8") TTL, 3V pulse, one pulse per pulse in internal mode. Mimics input pulse in external mode. Power source 3.6V DC internal lithium-ion rechargeable batteries Charge and run time 4-5 hour typical charge time, 5-6 hour typical run time are 6000 FPM and 2.8 degree flash duration with fully-charged batteries Dimensions 7.75 x 2.75 x 2.3"/197 x 70 x 58mm (H x W x D) Weight 0.6 lbs/0.2kg, including batteries H is height, the vertical distance from the lowest to highest point; W is width, the horizontal distance from left to right; D is depth, the horizontal distance from front to back. 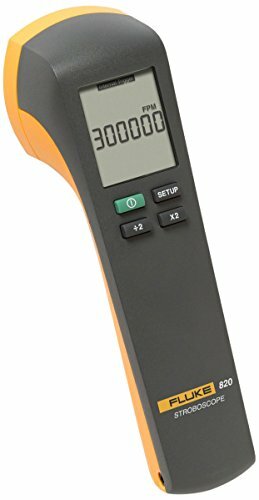 The Monarch 6235-010 PLS pocket LED stroboscope has internal and external modes, time delay, phase shift, and a NIST Certificate of Calibration, and provides inspection and speed measurement. It is designed for motion analysis, preventive maintenance, printing inspection, and speed measurement of repetitive motion. 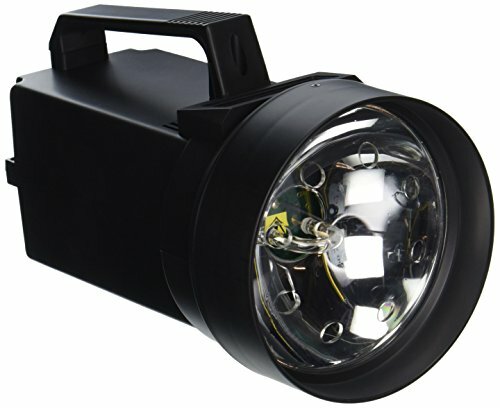 The 7-array LED light source has a light output of 1800 lumens at 6000 flashes per minute (FPM) eight inches from the lens. Adjustable flash duration of 0.1 to 18 degrees or 0.5 to 2500 microseconds. LED lights have a longer bulb life and require less energy than xenon flash tubes and can extend the battery life of battery-powered stroboscopes, have a lower heat output, and quieter operation when used in audio testing. The internal flash mode has a range of 30 to 300,000 FPM and 0.5 to 5,000 hertz (Hz) and has an accuracy of 0.005% of setting, or + or - last digit. The external flash mode has a range of 0 to 300,000 FPM, 0 to 5000 Hz and accuracy of + or - 0.005% of reading, or + or - last digit. A NIST Certificate of Calibration ensures accuracy. Built-in multiply-by-2 and divide-by-2 functionality allows the operator to distinguish true RPM from harmonics. Separate 3.5mm (1/8") transistor-transistor logic (TTL) input and output jacks provide power to remote sensors and allow multiple strobes to be daisy-chained to provide wider coverage. 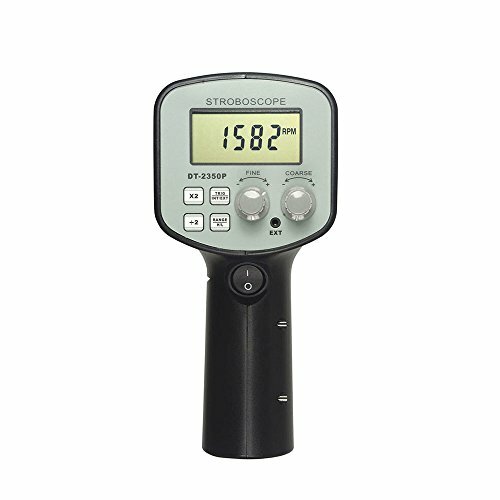 Tachometer mode, available for use while the stroboscope is in external mode, has a measuring range of 30 to 300,000rpm (requires remote sensor, not included). Phase shift of 0.1 to 18 degrees of rotation and time delay of 0.5 to 2500 microseconds allow operator to manually adjust the focal point of the object to any point in the rotation without moving the trigger point. A continuous duty and integrated 1/4" - 20 UNF (Unified Fine) thread mount enables the stroboscope to be used continuously over the life of the battery. Five user-selectable flash rates can be programmed into the device and recalled after powering off. The stroboscope is powered by 3.6V DC internal rechargeable lithium-ion batteries with an average run time of 5 to 6 hours between charges. 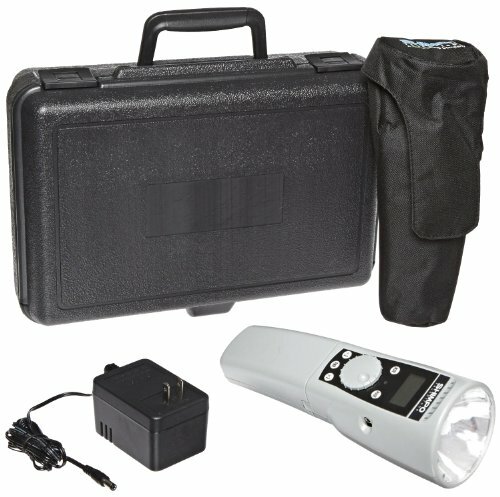 The stroboscope includes universal 115/230V AC battery charger with interchangeable wall plugs, a NIST Certificate of Calibration, a foam-lined latching carrying case, and instructions. It is RoHS compliant and CE marked. Stroboscopes are used in a variety of settings including manufacturing, printing, education, and photography. 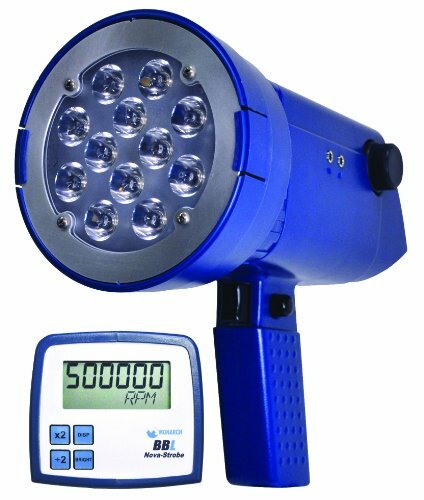 The Monarch 6230-010 BBL battery-operated stroboscope has a 12-array LED light source, a 30 to 500,000 flashes/revolutions per minute (FPM/RPM) range, and a continuous duty cycle to provide stop-motion inspection and speed measurement. It is designed for motion analysis, preventive maintenance, printing inspection, and speed measurement of repetitive motion. The 12-array LED light source has an adjustable flash duration up to 14 degrees or 3000 microseconds and a light output of 3000 lux. LED lights have a longer bulb life and require less energy than xenon flash tubes and can extend the battery life of battery-powered stroboscopes, have a lower heat output, and quieter operation when used in audio testing. The flash rate range of 30 to 500,000 FPM/RPM has an accuracy of 0.002% of setting, or + or - 1 least-significant digit/0.01 FPM. The internal NiMH rechargeable battery has a typical life-span of 8 to 10 hours at 1800 FPM and includes a universal 115/230V AC recharger. The stroboscope has a continuous duty cycle for the life of the battery. An integrated 1/4" - 20 UNF (Unified Fine) thread enables the stroboscope to be mounted on a tripod for long-term use. The stroboscope includes a universal 115/230V AC charger with interchangeable wall plugs and instructions. Stroboscopes are used in a variety of settings including manufacturing, printing, education, and photography. Handle: 4.254"/108mm Weight 1.9lbs./860g H is height, the vertical distance from the lowest to highest point; W is width, the horizontal distance from left to right; D is depth, the horizontal distance from front to back. 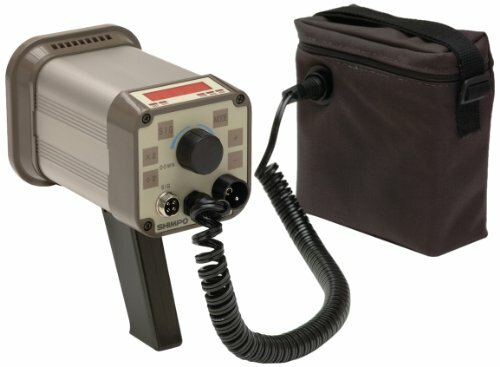 The Monarch 6206-010 Nova-Strobe 115V AC line-powered digital stroboscope has a xenon flash tube, a 30 to 10,000 flashes per minute (FPM) range, internal phase shifting, and continuous duty cycle. It is designed for motion analysis, preventive maintenance, printing inspection, harmonics analysis, and speed measurement of repetitive motion. The xenon flash tube has an auto-adjustable 8 to 20 microsecond flash duration to provide crisp images in brightly lit areas. Xenon flash tubes have brighter light output and a shorter flash duration than LED lights. Bright light output is required for quality images in brightly lit areas, and shorter flash durations provide sharper images, especially at high rates of speed. The stroboscope has a flash rate range of 30 to 10,000 FPM and a flash rate accuracy of 0.002% of setting, or + or - least significant digit/0.01 for use in slow-to-medium speed applications. Built-in multiply-by-2 and divide-by-2 functionality allows the operator to distinguish true RPM from harmonics. Internal phase shift functionality allows the operator to manually rotate the target location clockwise or counterclockwise in 5 degree increments. The built-in 1/4" - 20 UNF (Unified Fine) thread mount, continuous duty cycle, and 115V AC power source provide long-term use in permanent installations without the need for cool-down periods. Stroboscopes are used in a variety of settings including manufacturing, printing, education, and photography. Handle: 4.25"/108mm Weight 1.5lb H is height, the vertical distance from the lowest to highest point; W is width, the horizontal distance from left to right; D is depth, the horizontal distance from front to back. Used in motion studies in classrooms, physics and Q.C. labs. Convenient for non-contact measurement of running machinery in factories and elsewhere since, unlike tachometers, stroboscopes require no special reflective tapes. 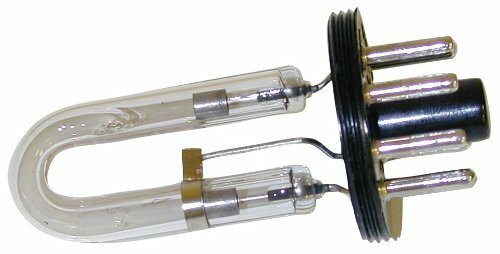 Powerful xenon lamp. The high 4 digit LED is easy to read in both light and dark environments. Microprocessor circuit with a crystal time base insures high accuracy over a wide range and does not require recalibration. Built in tripod screw. Works on 110V, 220V, 240V. Dimensions: 9 x 5 x 5 (235 x 125 x 125 mm) Weight: 32 oz (900 g). Internal rechargeable Lithium Ion battery uses latest "smart-charge" technology for longest possible life and 2-Hour run-time on a single charge, Battery run time of 2 hours on full charge. Operates when being recharged or run continuously via AC-power, Resolution of 1 RPM over the entire range with highly accurate speed control and drift-free operation. Bright XENON flash intensity (over 1200 Lux) with life of 200 million flashes, Accepts input from sensor for external flash triggering. Provided with a threaded insert on underside of strobe for mounting to articulating arm or other fixture, Universal (100 - 240V AC) AC-Adapter/Charger can be used anywhere worldwide. 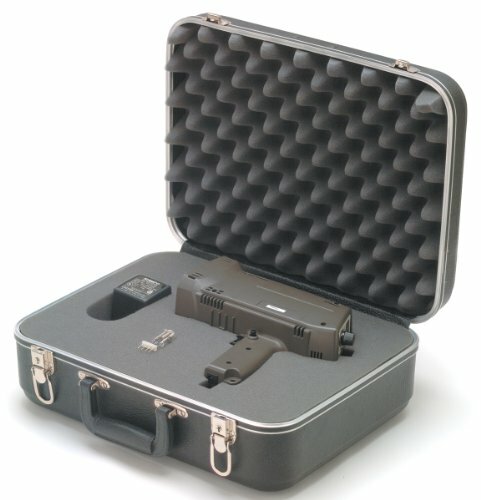 Portable, lightweight and rugged construction. The Stroboscope is capable to provide image of single, two or multiple stillness for the vibration object, rapidly rolling object, can also use to observe the movement tracks. * Digital display gives exact reading with no guessing or errors; Wide measuring range and high resolution. * Automatic stop flashing to save electricity and improve flash tube lifetime. * Internal / external triggering fast conversion; x2 and 2 button for fast adjustment. * Use photoelectric signal while external triggering, achieve automatic tracking function of the pattern. * Use microcomputer technology, emerging technologies, anti-jamming technique and other advanced technology, it can measure the rotative velocity without contacting the object. Use photoelectric signal while external triggering, achieve automatic tracking function of the pattern. Digital display gives exact reading with no guessing or errors; Wide measuring range and high resolution. The Shimpo DT-315AEB battery-powered digital stroboscope has a xenon flash tube, internal and external trigger modes, and time and phase shift to provide stop-motion or slow-motion viewing of moving machinery. It is used for motion analysis, preventive maintenance, printing inspection, and speed measurement of repetitive motion. The xenon flash tube has a 10 to 40 microsecond flash duration for crisp images in brightly lit areas and a flash timer conserves flash tube life. Xenon flash tubes have brighter light output and a shorter flash duration than LED lights. Bright light output is required for quality images in brightly lit areas, and shorter flash durations provide sharper images, especially at high rates of speed. A high-polish focused reflector eliminates blind viewing areas. Internal and external trigger modes have a 0 to 35,000 flashes per minute (FPM) range and an accuracy of + or - 0.01%, or + or - 1 digit. Built-in multiply-by-2 and divide-by-2 functionality allows the operator to distinguish true RPM from harmonics. Internal mode phase shift has a 360 degree range in six seconds. External mode has a phase shift range of 0 to 360 degrees in one-degree increments and a time delay of 0 to 2,000 milliseconds (msec) at speeds between 40 and 10,000 FPM. Time delay and phase shift enable the operator to adjust the focal point of the object to any point in the rotation without moving the trigger point. Synchronous output enables the stroboscope to drive other strobes for wider coverage. The stroboscope can be powered by an external battery pack for extended use. The battery pack is rechargeable using the 115V AC recharger (included). An integrated mounting thread and continuous duty cycle allow long-term use without the need for cool-down periods. The aluminum housing provides durability. 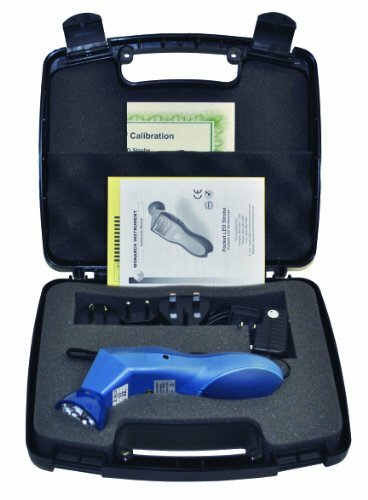 The stroboscope includes a flash tube removal tool, a handle, external battery pack, 115V AC battery charger/adapter, and instructions. Stroboscopes are used in a variety of settings including manufacturing, printing, education, and photography. 0 to 360 degrees phase shift in 1 degree increments Light source 10W xenon flash tube with 100-million flash life span Flash duration 10 to 40 microseconds Power requirements External battery pack with 115V AC recharger External battery pack dimensions and weight 6.3 x 4.3 x 2.8"/161 x 110 x 71mm (H x W x D), 4.5lb./2kg Dimensions 4.72 x 4.72 x 7.28"/120 x 120 x 185mm (H x W x D) Weight 2.6lb./1.2kg H is height, the vertical distance from the lowest to highest point; W is width, the horizontal distance from left to right; D is depth, the horizontal distance from front to back. The Monarch 6231-010 DBL battery-operated stroboscope has a 12-array LED light source, internal and external trigger modes, a 30 to 500,000 flashes/revolutions-per-minute (FPM/RPM) range, and a continuous duty cycle to provide stop-motion inspection and speed measurement. It is designed for motion analysis, preventive maintenance, printing inspection, and speed measurement of repetitive motion. 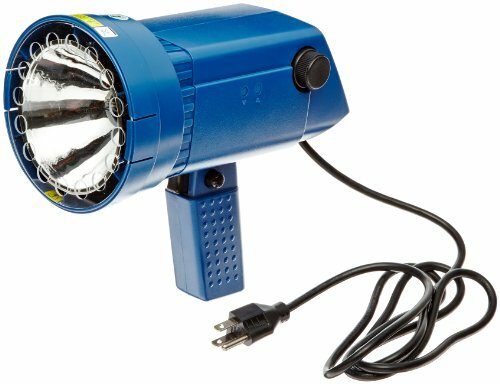 The 12-array LED light source has an adjustable flash duration up to 14 degrees or 3000 microseconds and a light output of 3000 lux. LED lights have a longer bulb life and require less energy than xenon flash tubes and can extend the battery life of battery-powered stroboscopes, have a lower heat output, and quieter operation when used in audio testing. The flash rate range of 30 to 500,000 FPM/RPM has an accuracy of 0.002% of setting, or + or - 1 least-significant digit/0.01 FPM. A NIST Certificate of Calibration ensures accuracy. Built-in multiply-by-2 and divide-by-2 functionality allows the operator to distinguish true RPM from harmonics. Separate 3.5mm (1/8") transistor-transistor logic (TTL) input and output jacks provide power to remote sensors and allow multiple strobes to be daisy-chained to provide wider coverage. 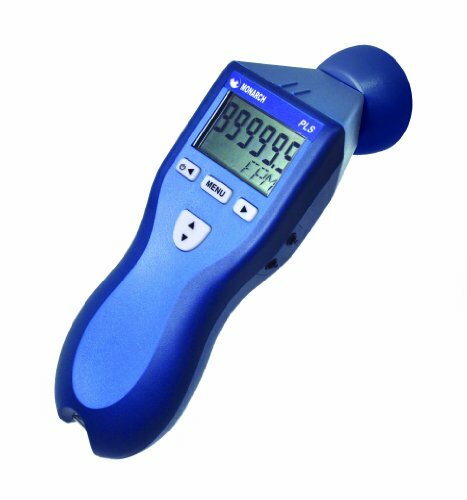 Tachometer mode, available for use while the stroboscope is in external mode, has a measuring range of 5 to 200,000 rpm and an accuracy of + or - 0.01% or 0.1 rpm (remote sensor not included). Manual internal phase shift allows the operator to view the object at any point in the cycle without moving the trigger point. The internal NiMH rechargeable battery has a typical life-span of 8 to 10 hours at 1800 FPM and includes a universal 115/230V AC recharger. The stroboscope has a continuous duty cycle for the life of the battery. An integrated 1/4" - 20 UNF (Unified Fine) thread enables the stroboscope to be mounted on a tripod for long-term use. The stroboscope includes a universal 115/230V AC charger with interchangeable wall plugs, a NIST Certificate of Calibration, and instructions. Stroboscopes are used in a variety of settings including manufacturing, printing, education, and photography. The Shimpo DT-725-230V battery-powered digital stroboscope has a xenon flash tube, internal and external trigger modes and a continuous duty cycle. It is designed for motion analysis, preventive maintenance, printing inspection, harmonics analysis, and speed measurement of repetitive motion. The xenon flash tube has a 10 to 15 microsecond flash duration to provide crisp images in brightly lit areas. Xenon flash tubes have brighter light output and a shorter flash duration than LED lights. Bright light output is required for quality images in brightly lit areas, and shorter flash durations provide sharper images, especially at high rates of speed. The stroboscope has a 40.0 to 12,500 flashes per minute (FPM) range and an accuracy of + or - 0.02% of reading. Built-in multiply-by-2 and divide-by-2 functionality allows the operator to distinguish true RPM from harmonics. Internal mode phase shift has a 360 degree range in six seconds. Phase shift enables the operator to adjust the focal point of the object to any point in the rotation without moving the trigger point. Synchronous output enables the stroboscope to drive other strobes for wider coverage. The 5-digit, 8mm tall LED display eases reading in low lighting. An integrated 1/4" - 20 Unified Coarse (UNC) mounting thread and continuous duty cycle provide permanent installation and long-term use without the need for cool-down periods. The high-impact plastic housing provides durability. The stroboscope includes a 230V AC adapter and instructions. Stroboscopes are used in a variety of settings including manufacturing, printing, education, and photography. Switch or relay contact Power requirements Internal rechargeable battery with 230V AC adapter, 50/60Hz Battery life 1 to 2 hours, depending on flash rate Housing High-impact plastic Dimensions 8.5 x 4.3 x 9" (H x W x D) Weight 2.75lbs./1.25kg H is height, the vertical distance from the lowest to highest point; W is width, the horizontal distance from left to right; D is depth, the horizontal distance from front to back. TechStrobe traveler kit from Shimpo Instruments is the perfect tool for slow motion, or stop action stroboscopic inspection. The Shimpo TechStrobe is the only palm size unit to include a Phase shift feature. Phase shifting allows the TechStrobe operator to advance or retard the flash timing by degrees of angle, without changing the actual flash rate (FPM) of the TechStrobe. Employing its unique Phase shifting feature, the TechStrobe "freezes" rotating or reciprocating machinery for visual inspection of covered gear teeth, shafts, oil/fuel/ink injector patterns, and print media; all without stopping production. The ergonomically designed battery serves as the padded grip area. The battery is quickly detached and recharged while another battery is snapped into place. Designed for right or left hand, all TechStrobe functions are intuitive and easy to use. Quality and Maintenance Professionals will appreciate the rotary and push button controls for internal flash (FPM/RPM) control, external triggering, tachometer mode and Phase shift control. The push buttons rapidly increase (x 2), or decrease ( 2) the flashes per minute (FPM) and change by degrees the Flash phase. Compact, impact resistant and rugged, with that balanced feeling for one-handed operation, the TechStrobe will quickly become one of the Quality and Maintenance Professionals' favorite tools. Small hand held design fits most hands, easy to hold. Light weight/padded handle reduced fatigue, easy to hold. Tri-pod mount, hands free holding with (1/4 x 20) mounting for swing arms, camera style tripods. Rotary and push button flash control, fast up/down push button, fine tune with rotary encoder. Flash phase shift precise flash timing control (5 degree increments) push button or rotary control. Because of fast charger, no long wait for re-charging. Continuous duty (adjustable), full time flash with selectable "automatic off". Tach mode Provide RPM display when external sensor is attached.